The Bermuda 1-2 certainly was a fantastic three weeks for Joe Harris and the big red Open 50 Gryphon Solo. First, Joe broke the record in Leg 1, won Class 5 on corrected time and elapsed time and had a fun week in St George's Bermuda. Next, he and sailing partner Dobbs Davis won all they could in Leg 2, taking line honors in the 635 mile slog beating the next boat, the Open 40 Wildeyes, by 28 hours and 19 minutes, winning first in class 5 and first overall on corrected time. Finally, Gryphon Solo won the Combined Leg 1 and 2 prizes for both combined elapsed time and combined corrected time. Sailing solo, Joe smashed the old course record for the solo leg of Bermuda 1-2 earlier this month. His elapse time sailing south was 62:37 from his start on June 9th. He beat the old record by 4 hours and 20 minutes .The old Bermuda 1-2 solo course record was set in 2005 by Kip Stone aboard the Open 50 Artforms. Then Joe and sailing partner Dobbs Davis clawed their way to line honors in the double-handed leg of the Bermuda 1-2. 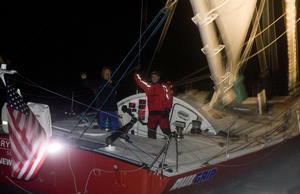 They drove Gryphon Solo across the finish line at marker R2 off of Newport at 23:41:30 on Monday night. Their elapse time from the Friday start from St George's Bermuda was 82 hrs 41 min 30 seconds. The next closest boat when Joe finished was Wildeyes sailed by Michael Millard and Jim Fauci was almost 200 miles southeast of Newport. "It has been a great event for all of the Gryphon Solo sailing team," said Harris before heading home to Hamilton, MA from Newport. "We did just about everything we set out to do in the Bermuda 1-2. We didn't win Leg 1 on corrected time overall, but setting the new elapse time record was something special. Working with Dobbs Davis on Leg 2, we pushed the boat hard to escape from foul current and light wind in the Gulf Stream and pull away from the fleet. For the combined legs we beat the next boat by 44 hours on elapsed time and 15 hours on corrected time." "This was a great introduction for me to doublehanded sailing," crewmate Dobbs Davis said, "and I couldn't have had a better mentor than Joe. Despite some trying conditions, we had a great time sailing together. I think his knowledge and experience will make him a potent force in his future races on Gryphon Solo." Gryphon Solo shore team Hugh Piggin and Jamie Haines are now setting up the boat with a new suite of Doyle sails to test in the 360-mile Marblehead to Halifax Race starting July 8th. These sails will be used in the around the world Portimao Global Ocean Race beginning in September 2008.
Review the race on iboattrack at http://www.iboattrack.com/.